WaterFire takes place over one half-mile distance in the river parks lining the three rivers in downtown Providence, Rhode Island. It is best enjoyed by walking and strolling. How Do I get to Providence? WaterFire takes place in downtown Providence, Rhode Island, along Memorial Boulevard and the Providence and Woonasquatucket Rivers. It is right at the heart of downtown and runs for just over one-half mile from Providence Place to the Crawford Street Bridge. Providence is about a 50 minutes drive from Boston. Providence is a wonderfully walkable city and we encourage you to start your adventure off by enjoying the spectacular architecture of the city. You can park in the nearby residential areas of College Hill on the East Side and easily walk down the hill to WaterFire. WaterFire is one block from the Amtrak Providence Train Station and is also served from Boston by the MBTA and commuter trains and is about a 45-minute train ride from Boston. Check out the new MBTA Beginner’s Guide to the Commuter Rail. From Interstate 95 North or South, take exit 22 to downtown. The off-ramp brings you onto Memorial Boulevard which runs along the river. WaterFire is on your left after the first set of lights, and the installation extends down past the Crawford Street Bridge. From Route 195, follow the signs for Route 95 north (towards Boston). Stay to the right, take exit 22, and follow the directions above. Providence Place Mall: Convenient paid parking at the west end of the installation. Use 1 Providence Place. Metropark Lot: Convenient paid parking lot at the exact center of WaterFire. Use Moshassuck Ct.
Providence’s T.F. Green Airport has the best and most convenient traveling services in New England and WaterFire is only 15 minutes from the airport by car. Extensive air service and car rental facilities are available at the airport. In addition to more than 40 parking lots and garages, downtown Providence has over 1,100 on-street parking spaces. 12 minutes of parking costs $.25, which translates to $1.25 per hour. Both single space and multi-space meters accept nickels, dimes, quarters and dollar coins, as well as credit cards (Visa, Mastercard, and Discover). Dollar bills are not accepted. Generally, you must pay to park at a meter from 8:00 a.m. to 9:00 p.m., Monday through Saturday. (Note the extension from 6:00 p.m. to 9:00 p.m.). There are some exceptions, so please read the signs. Before 8:00 a.m., and after 9:00 p.m., you may park in those spaces for FREE. Please note: overnight on-street parking is not allowed! You may not park on the street between 2:00 a.m. and 5:00 a.m. More info about on-street parking in Providence can be found on the Park Downtown Providence website. The Rhode Island State House offers short-term parking at One Capitol Hill; specific directions to that parking lot can be found here. The Providence Place Mall also offers short-term parking in their garage. This parking lot stays open after the mall closes, and payments can be made at the garage’s exit if the mall is closed. More information/specific directions can be found here (the hours listed refer to the mall’s hours, not the parking garage’s, which remains open all night). If you want to register an extra spot in your driveway, sign up with Spotter here: www.parkwithspotter.com/dashboard. 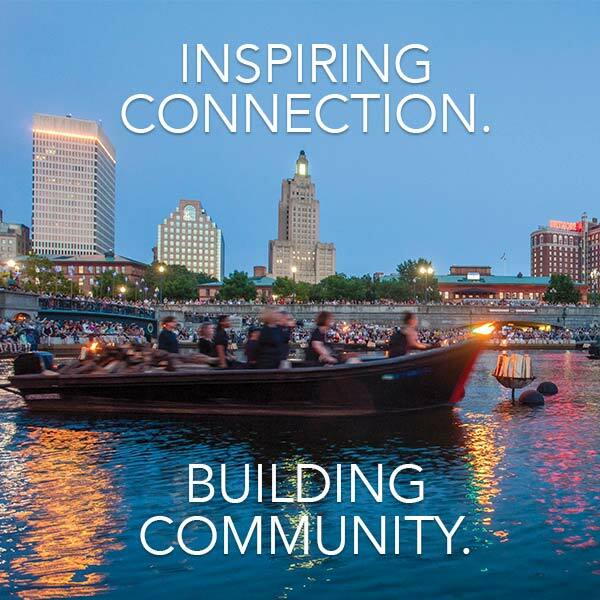 Then, turn your spot into a HotSpot by enabling its proceeds to go to WaterFire Providence. Please check out Restaurants & Hotels, Other Attractions, FAQ, and WaterFire Access for more information about your trip to Waterfire! There are several on-ramps to I-95 and I-195 to get you safely home. Some of the larger parking lots get particularly congested around 10:00 and you may wish to delay your departure and enjoy WaterFire for a little longer. Northbound: I-95 can be reached by heading north/west on Memorial Blvd and taking the on-ramp at Francis Street by Providence Place and the Weston (under the modern yellow pedestrian bridge). Alternatively, I-95 North can be reached by heading north on North Main Street and taking on-ramps on Charles Street by the Marriott or on Branch Ave, or on Smithfield Ave.
Southbound: I-95 can be reached by heading north/west on Memorial Blvd and taking the on-ramp at Francis Street by Providence Place and the Omni Providence Hotel (under the modern yellow pedestrian bridge). Alternatively, I-95 South can be reached by traveling south/east on Memorial Blvd past the fires and getting on the westbound on-ramp of I-195. The on-ramp is on the right and is two lights past Crawford and Pine Streets. Eastbound: I-195 East can be reached by traveling south/east on Memorial Blvd past the fires and getting on the eastbound on-ramp of I-195. The on-ramp is on the far side of the I-195 overpass on the left and is two lights past Crawford and Pine Streets. Alternatively, it can be reached by heading north on Memorial Blvd and taking I-95 South to the I-195 exit. Westbound: Route 6 West can be reached by heading north/west on Memorial Blvd and proceeding west directly on Route 6 at the on-ramp at Francis Street by Providence Place and the Omni Providence Hotel (under the modern yellow pedestrian bridge).